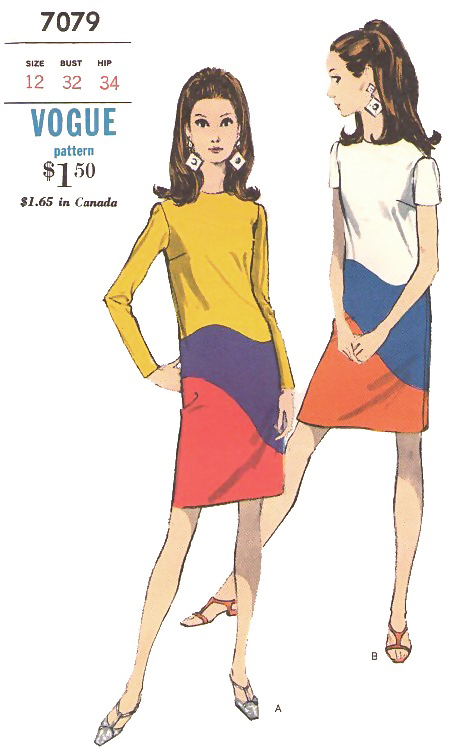 You might be able to research the pattern sale dates using The Commercial Pattern Archive. I found out about it because of Witness2Fashion’s blog – she’s shared a lot of historical information and dating of patterns in her posts. Thanks so much for the tip, Brooke. I checked out the site and one needs a paid subscription to access the database. I may be blown away by the size and scope of the database, which piques my curiosity, but I’m also afraid that I may be disappointed, which makes me hesitant. But I’ll keep it in mind for the future if I feel that the info I require will justify paying the fee. Interesting! I’d never seen this pattern before. From the numbering it would have been out by spring 1967. The PatternPatter (sellers’) team on Etsy has a group membership to CoPA with a very reasonable annual fee. The archive doesn’t give more dating info than the year, though, but I’ve found it very accurate for earlier patterns. Sarah, I’m impressed by your knowledge of the numbering system – I have never before paid much attention to pattern numbers or their significance. I’ll try signing up to PatternPatter – hopefully I may also be able to contribute something to the group. 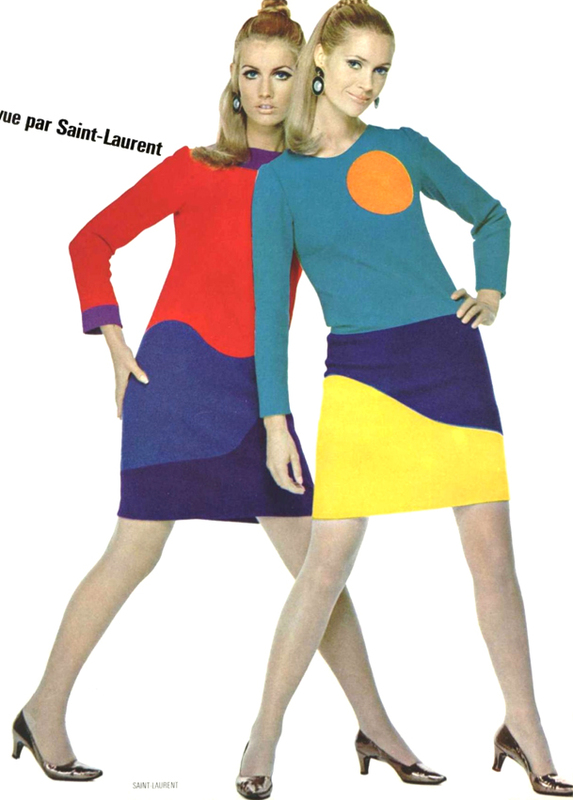 I have seen the long black YSL dresses featuring a face and a body at the V&A, and they were stunning, but I was completely unaware of these lovely colourful short dresses from 1966/67. 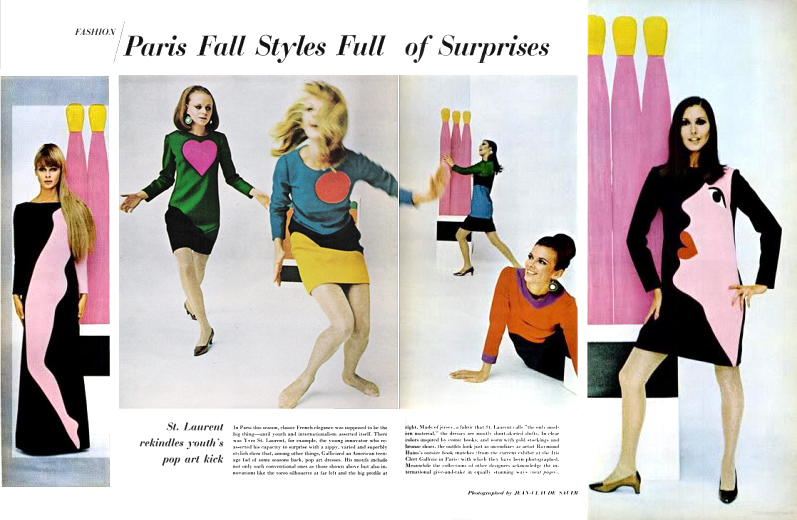 How interesting that Vogue copied them! They are certainly talking to me – not too hard to copy I would say. 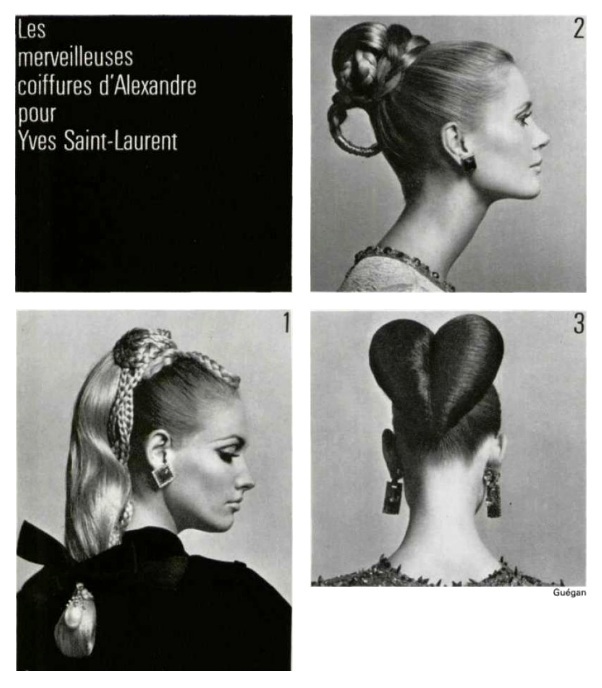 I also love that you have included information on the original hair styles and then to see how Vogue has included a simplified version and big earrings on the pattern envelop. I also like to see the shoes and stockings suggested. You are lucky to live in London and have access to the excellent museums there. Occasionally we have some really good costume/fashion exhibitions here in Australia, which sometimes borrow from the V&A, but not nearly enough for my liking. 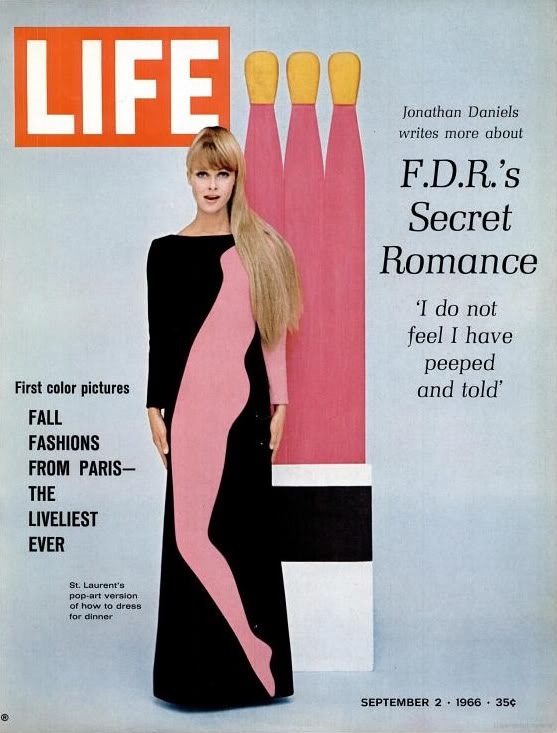 I love the photograph by Helmut Newton of Catherine Deneuve wearing that long black dress with the pink body-in-profile, it looked perfect on her. Fascinating! Those Vogue 7079 dresses look simple, but I suspect they would not turn out well without some precise couture techniques used in their construction! The pattern allows for underlining, but not lining. I think I would underline the dresses with organza and then line them properly as I imagine that there would have to be quite a bit of clipping into the seam allowances when stitching those curved seams which would end up looking a bit messy. Also, matching the seam markings would be crucial when sewing those curves. Not for absolute beginners, for sure! Thanks for that, Julie. I had come across that page on the vintagepatterns.wikia site when searching for any info that may have been out there regarding the pattern, and I’m confident that the year is correct, but I’d love to get a more specific date, particularly by finding out which issue of the ‘Vogue Pattern Book’ or ‘Vogue Pattern News’ this pattern may have been featured in. Anyhow, thanks for helping out, and for stopping by the blog!